Topaketa honetan, Abdulen, errefuxiatu siriar baten, testigantza lehenengo eskutik jaso ahal izan dugu. Pertsona hauek jasan izan dituzten eta jasaten dituzten zailtasunez ohartarazi gaitu, bere errealitatea, askorena dena, guregana gerturatuz. Norbere burua bere etxetik ihes egitera behartuta ikusten duenarena, senideak eta lagunak urrun dituenarena, ogibide zuena alde batera utziz eta babesgabeturik beste herrialde batean lurreratuz. Askoren egia den errealitate hutsa lehenengo pertsonan jasoa. Kontzientzia har dezagun zenbat traba, zenbat oztopo izan dituzten dauden lekura heldu izan diren arte, baina … eta behin hona heltzen direla? Noizbait ardura izan dugu pertsona hauek egunez egun bizi beharreko baldintzetan pentsatzeko? Aurre egin beharreko zailtasunetan erreparatzeko? Hizkuntza, lanbidea, ikasketak … Lerro hauen bidez irakurleoi transmititu nahi dizkizuegun hausnarketak dira. 2016. ikasturtean, Buztintxuriko ikasleek San Fermineko Kartelan irabazitako saria “Iruñea, harrera-hiria” plataformari eman zioten. Ikasleriaren keinua ikusirik, trukean gure ikastetxera bisitan etorriko ziren hitza eman zuten. Orduantxe jaio zen gure ateetaraino ekarri zien lotura eta harreman estua. Hitza eman eta etortzeaz gain, eurekin “Bienvenidas, Ongi etorri, Welcome” erakusketa eleanitza ekarri dute. Martxoaren 11ra arte edonork ikusteko eskainia egon da. 10 panelek osaturiko erakusketa. Gizartearen formazioa eta kontzientziazioa erronkatzat duen tresna. Munduan milioika pertsonek lekualdatzera behartuta sentitzen diren arrazoiak ikasleekin lantzeko, baita gauzatzen diren politika arrazistak ere. Hauek dira 4. mailako ikasleei zuzenduriko bi proposamenak, gainerako hezkuntza- komunitatean lantzekoak. Azkenik, irakasleok jasotako gertutasuna eta tratu atsegina eskertu nahiko genuke. 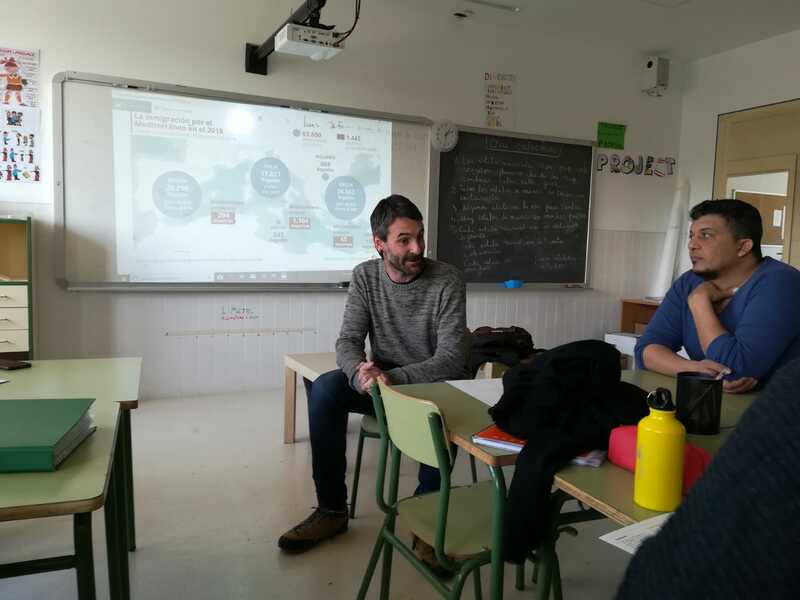 This week, Xabi, a member of the plataform “Iruña, ciudad de acogida- Iruñea harrera hiria” and Abdul, a member of the NGO “Personas Refugiadas en acción- Errefuxiatuak martxan”, have visited the 4th grade teachers. 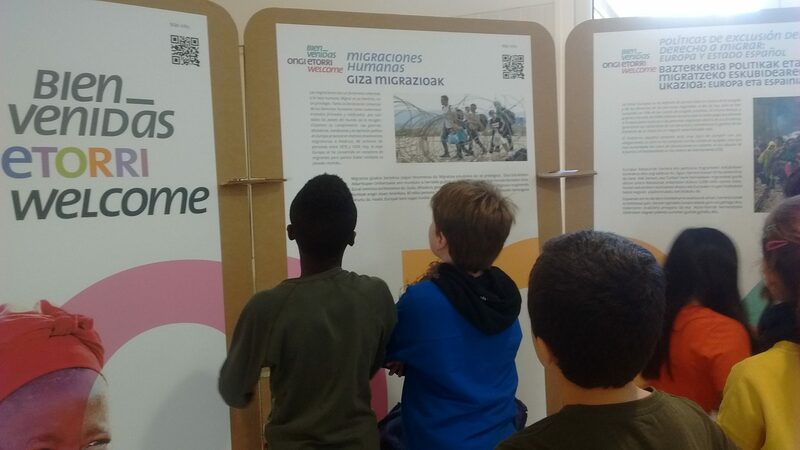 They have shared with us their point of view about the nowadays migratory context and the work that they do with migrants and refugees. It has been a very rewarding and educational experience. 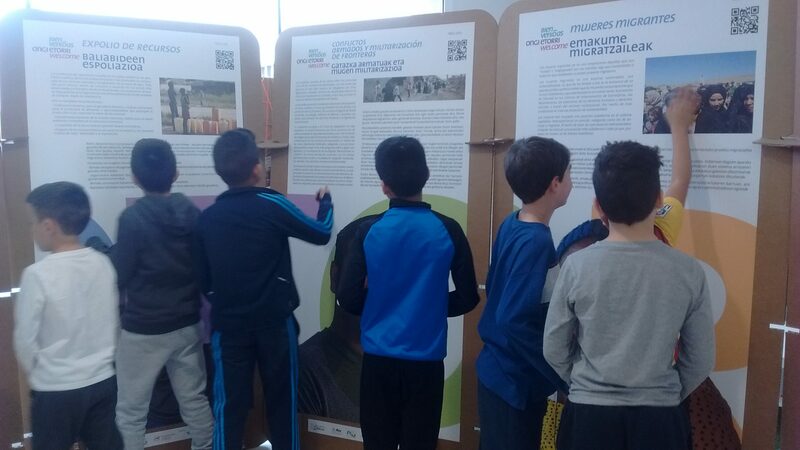 Since 2016, when the students of Buztintxuri donated the San Fermín poster award to the citizens initiative “Iruña, ciudad de acogida- Iruñea harrera- hiria”, they committed themselves to visit our centre and born this relationship that finally brought them to us. 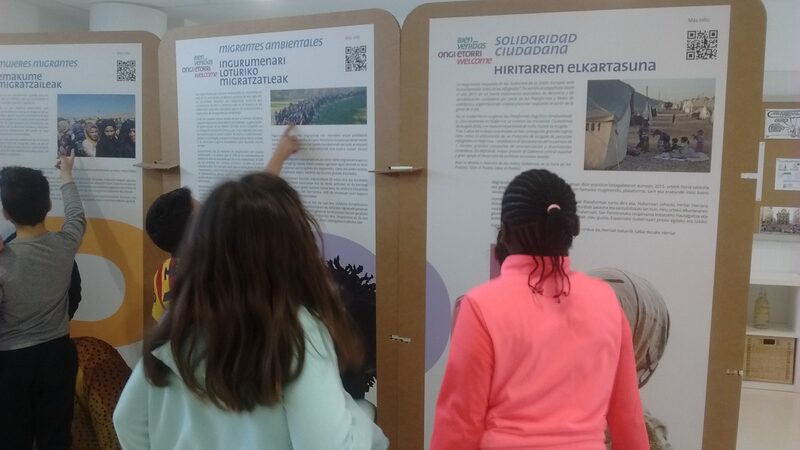 Fulfilling their promise to visit the school; they have not only shared their own experiences and realities but also, they have offered us the trilingual exhibition “Bienvenidas, Ongi etorri, Welcome”. 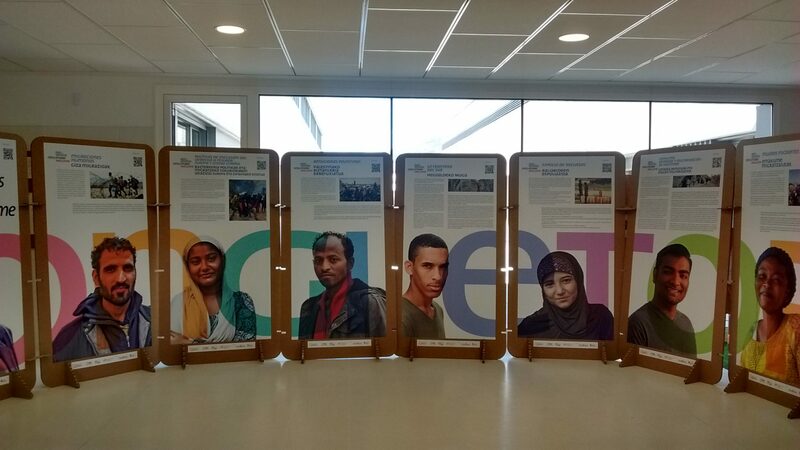 This exhibition has been open to the entire educational community until 11th of March. 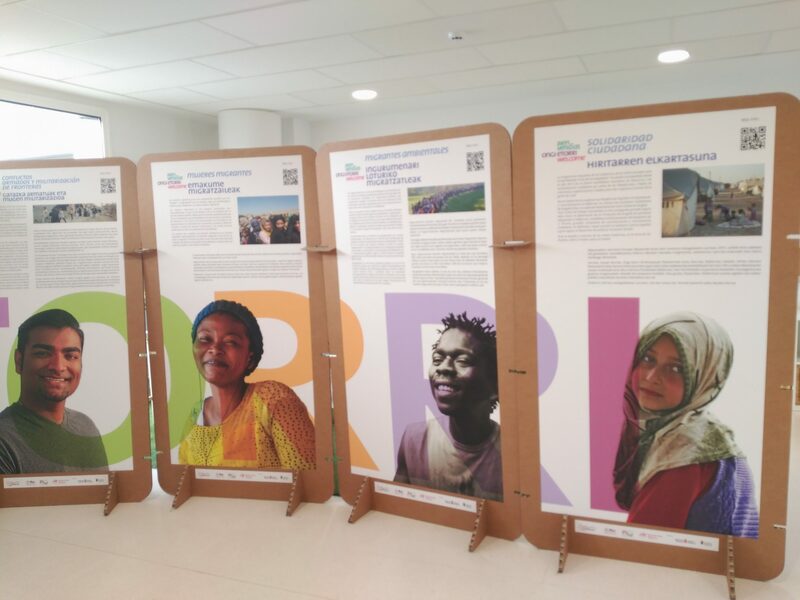 The exhibition is equipped of 10 sheets as a training and awareness. 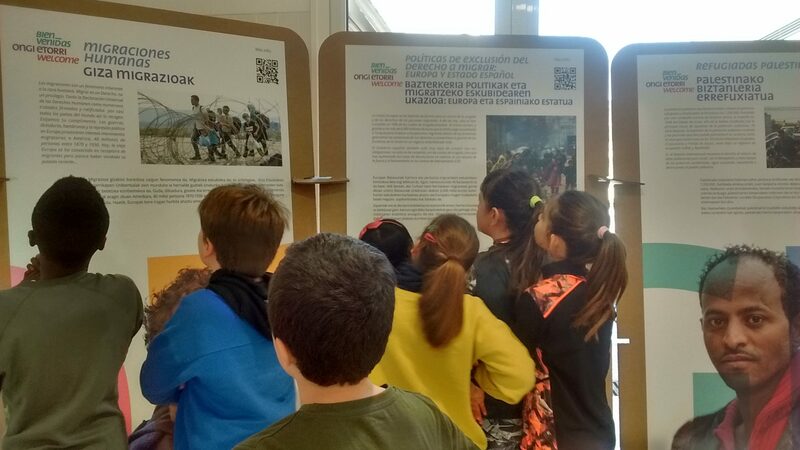 It is a tool to work with our students on the reasons that cause the forced movements of millions of people in the world and racist policies. Two proposals addressed to 4th year students, but also, to work in the entire educational community. Last but not least, we would like to state the very close treatment we have received and how rewarding it has been.